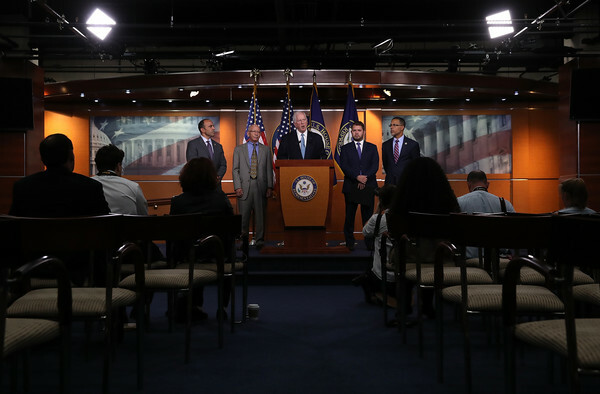 Rep. Mike Thompson (C) (D-CA) speaks during a press conference at the U.S. Capitol July 18, 2018 in Washington, DC. Thompson and other members of the House Democratic caucus who are military veterans spoke out "against the president's summit with Putin where he denounced the intelligence community and suggested Russia did not interfere in the 2016 presidential election." Also pictured (L-R) are Rep. Jimmy Panetta (D-CA), Rep. Peter DeFazio (D-OR), Rep. Ruben Gallego (D-CA), and Rep. Anthony Brown (D-MD).